Marigold ointment is certainly something that is desirable for each of us to have in our household, it is a remarkable multipurpose natural medicine. The Latin name for the marigold is Calendula officinalis. It is very healthy and is used in various forms as oil or tea and is widely used in cosmetics, for the treatment of the digestive system, especially with haemorrhoids. In ancient times it was regarded as a plant that was used for rejuvenation, and with its petals food was decorated. Many say that the fat of calendula is the best balm for skin and that there is no skin disease in which it does not help. The use of calendula balm and cream is accepted by doctors of modern medicine, because this plant has antimicrobial, antioxidant and antibacterial activity. Below find out how to make the marigold ointment and for what can it be used. Calendula officinalis is a hardy plant that originated in distant India. Marigold flower is bushy, herbaceous, hairy plant, and his tree his widespread and upright. Size of flower head is 5 to 10 cm and are formed on the top of each stem. In the centre of flower stalks there are tubular fertile flowers. The leaves are alternate, broad and seated. Each branch bears a flower on top of which is bright orange or yellow. The blossoms have a strong odour, and the leaves are sweet and bitter taste. The flowers contain essential oils used to make marigold ointment, vitamin C and flavonoids. Due to its healing properties whole plant is used. We can saw marigold immediately in early spring, at a fixed place, and when it sprouts that we can propagate it to a distance of 30 to 40 cm form other plants. The best time to harvest is August and July, mid-day, when it is sunny and warm. If there are high temperatures in July, it suddenly flourish and gives seeds, but with the first rain plant rejuvenates. Drying marigold should be quick, when the temperature outside is 35 degrees. Separate the petals from the flower, which need to be specifically dried. This is a favourable plant that is readily grown in the gardens. It is not sensitive to drought, it likes a warm climate. On earth rich in humus it gives real yields. From precious flower heads we obtained marigold ointment and other medicinal preparations, read more below. Therapeutic use of calendula comes from ancient Egypt, from where it was spread to Europe. Marigold has traditionally been used as a cream for wounds that heal slowly because it improves skin regeneration. It is used also with various skin disorders such as acne and eczema. Marigold ointment for veins is used equally in varicose veins and haemorrhoids, and wounds on lower legs and skin ulcers. It restores mucous membranes, and is also used for intestines and stomach, with sores in the mouth and vaginal douches. The flowers are yellow because they contain carotenoids, which are converted into vitamin A. The vitamin is an antioxidant that prevents cell damage and often is used for the preservation and improvement of visual function of the eye. Marigold reduces stomach cramps, is used for menstrual pain and discomfort caused by bile. It is also used in tea blends for the cancer. It is used in asthma. Cold tea of ​​calendula is used for flushing the eyes, with inflammatory conditions of the eye, rinse mouth sores, canker sores. Marigold ointment is also used for fungal diseases or as a tea to flush mucous membranes and skin that is affected by fungus. Marigold tea is applied with liver disease and infectious jaundice. It acts as a mild sedative, and is applied in cases of nervousness and insomnia. During pregnancy it helps to avoid creating stretch marks on the thighs and abdomen, lubrication with marigold ointment is very effective. Usually during pregnancy haemorrhoids can occur, and at the first signs of burning and itching you can preventively use domestic marigold ointment for haemorrhoids. 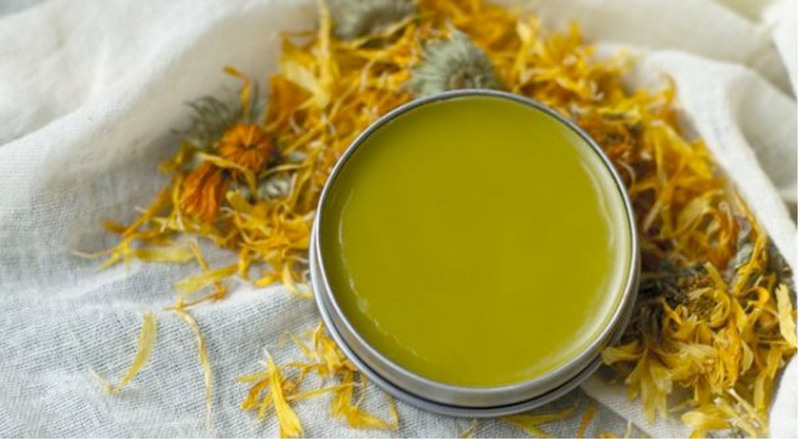 To make marigold ointment you can use hemp oil containing a high percentage of essential fatty acids, which are especially useful for the treatment of skin problems such as dry skin and eczema. It also is easily absorbed and not too greasy, but can be replaced with olive oil, which has a longer shelf life. When you make marigold ointment you need to make sure you do not overheat it. Oil and petals of the flower must slowly be warmed up on a low flame in order to avoid cooking. Making the marigold ointment may be a good chance for your toddler to participate and to learn something. Your child can collect the petals and mix them in a bowl. 10 drops of essential oil of lavender. Pour the petals of calendula in a stainless steel pot, and sprinkle them with oil. Then put it on a slow fire and stir the contents until they unite. Pay attention to the bubbles in the oil and make sure that the temperature is appropriate, because it should not be higher than those at which small bubbles start to appear. Continue to mix the contents of the pot for 2 hours, maintaining a relatively warm oil. In the meantime, you can start to melt wax, but be careful not to overdo it with the temperature as wax and oil need to be about the same temperature when the time comes for them to mix. When 2 hours pass, strain the petals of oil, and squeeze out as much as oil as possible in a bowl. Then slowly pour the oil into the pan with wax, stirring until they unite. In this mixture, add 10 drops of lavender essential oils. This oil has a dual role as a preservative and has healing calming effect. Pour the hot oil in small containers or jars and allow it to cool slightly. The jars in which you pour marigold ointment should not be transparent, but with stained glass. But the best would be to select an appropriate plastic boxes of cosmetic products. Seal and keep your marigold ointment in a cool place. Remove petals of calendula and with gentle stirring fry in hot fat until they wilt. Let it stand for one day and then again warm a little and strain through cheesecloth in a small glass jars. When marigold ointment cools, seal the glass jars and store in a cool place. Apply the ointment on the sore and inflamed place. Marigold is a medicinal plant, it can be found in various forms, like tea, oil, and is widely used in natural cosmetics. Marigold ointment is most commonly used for skin diseases such as eczema, psoriasis, and acne, seborrhoea, skin infections caused by bacteria, viruses or various fungi. Often it is used in cosmetics because it reduces pores, removes pimples, spots on the skin and reduces the appearance of purulent acne scars and their visibility. The first thing you need to do is to make a strong infusion, pouring the boiled water over the petals. Cover the bowl and leave it for a while to cool down. Then put the emulsifier and glycerine in a pot that is over a bowl with water which is slowly cooking, mix until everything is melted for about 10 minutes. Move from the heat and add 150 millilitres of infusion of calendula with tincture of benzoic and oil of calendula. Stir until it cools, pour calendula ointment in small jars and close them well. This is an excellent mild cream and is suitable to all skin types. The medicinal marigold ointment is an effective tool against varicose veins. This balm is useful for inflamed veins. To prepare the marigold ointment it is necessary to finely chop 4 hands of calendula, namely flowers, leaves and stems, and 500 grams of fat that you will heat and add chopped marigold. Mix well and remove from heat when it boils. Cover it and leave it overnight at room temperature. The next day, heat the mixture so you can strain it. Marigold ointment should be kept in an appropriate container. You can use it on a daily basis by rubbing it on the affected area several times a day. The best effects will be achieved if you combine marigold ointment and horse chestnut, in that way so that you first rub marigold ointment, and after a few minutes use horse chestnut. In this way you will achieve a more intensive treatment, which proved to be extremely practical. Can marigold ointment be used during pregnancy? 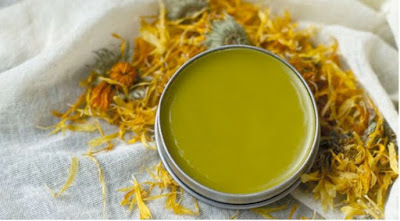 Marigold ointment is completely natural and is recommended for dry and sensitive skin. There are no contraindications, but allergies are common in people who are allergic to ragweed. Pregnant women should be cautious when it comes to oral administration - tea and other preparations, but local ointment of calendula is mainly used. However, do not do this on your own, you are advised to inform your doctor. Do not use it in combination with barbiturates. Marigold ointment allows the skin to breathe and does not close the pores. Children can use it. You can apply the ointment several times a day. Marigold ointment is excellent against burns caused by the sun. What is the price for the marigold ointment and where there to buy it? Calendula ointment you can be bought in any better equipped pharmacies, we found ointment for varicose veins in a healthy food store. Price is around 3 dollars depending on the manufacturer. It is a completely safe product, which does not cause any side effects. Read related article marigold tea.